I haven’t read a book this good for quite some time. It’s cinematic, enthralling and addicting. The story started when the earth is no longer habitable. The blazing sun becomes unbearable and people are striving to survive. Tora lives by herself, secluded and away from the consulate. Protecting her father’s inventions is her top priority. Once it falls into the wrong hands, it can lead to dangerous supremacy and huge disaster. Will she be able to protect herself and her father’s inventions, now that many wants it for power? The world-building is astounding. It is movielike and easy to dive into. Once you immerse yourself inside the book, you won’t stop reading. It is fast-paced not to the point of stumbling. I also like how she writes. The story is easy to comprehend and she makes it suspenseful too. I keep on guessing the people Tora could really trust, but ends up being surprised. What I also enjoy is the action scenes, it’s very unpredictable. There’s blood and lots of killing. The character-building is good. They are all charismatic and likable. I was able to connect with Tora, the main character. Her emotions are raw and can be felt by the readers. As for the villain, you won’t be able to guess who the wrongdoer is really. Since you won’t know who can be trusted yet as the story continues. Also, the assortment of characters made this book memorable. As for the romance-angle, No insta love here, which made me really happy. Since I hate love at first sight. Tora’s relationship is a bit rocky due to the given situation. But there were some scenes that gave butterflies in my stomach. The ending left me with an open mouth. The book ended with a cliff-hanger –haha- Making me hungry for more. 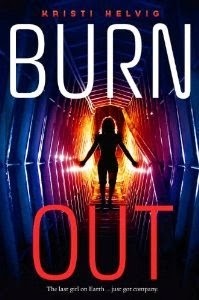 Overall, Burn Out is a good read for Post-apocalyptic and action lovers. Book two please!